The crypto market is alive and kicking. Does this come as a surprise? It shouldn’t. If you are focused on headlines that forecast the end of the crypto market you feel scared. But at the moment of writing a total of 301 articles were recorded forecasting the crypto market is dead, particularly Bitcoin (BTC) of course. Not sure whether we should write ‘was’ dead, but you get the point. InvestingHaven is on record forecasting that the crypto market is alive and kicking in 2018, yes even with the sell off in crypto prices this year. We see 5 fundamental drivers, and we conclude 5 reasons why the crypto market is alive and kicking in 2018. The crypto market is alive and kicking in 2018. It is here to stay as there are plenty of cases which deliver lots of added value. Think of shortening payment cycles from 4 days to 4 minutes (think of Ripple), platforms enabling multiple payment methods to talk to each other, peer2peer transactions in energy, and so on. There is mostly a financial aspect to crypto. That’s why it is fair to consider crypto as an asset class, a monetary or financial asset class, regardless how the SEC has categorized cryptocurrencies (being a commodity). 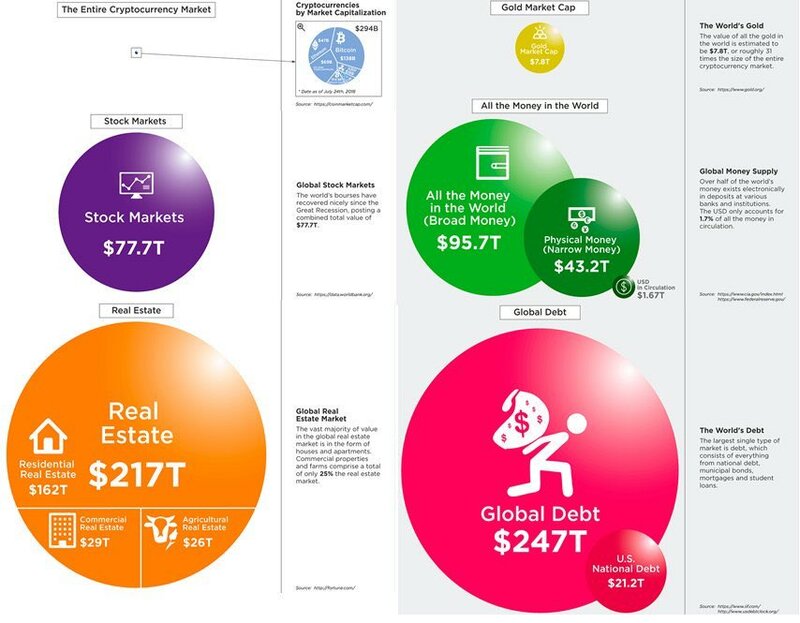 As seen on the first chart cryptocurrencies as a new asset class are so tiny compared to all other asset classes on this world. They are hardly visible (state of the crypto market in Q2 2018). There is so much room for growth. We are convinced that blockchain and crypto deliver so much value that they will grow over time, and that growth has plenty of potential. It is a matter of time! Here is the second of the 5 reasons the crypto market is alive in 2018: adoption is very light! Who remembers the tech bubble? Literally everyone had tech stocks back then. Right now, however, there is only a minority of people holding cryptocurrencies. How can anyone call this the top of a bubble? Roughly 8% of Americans invest in cryptocurrencies such as Bitcoin, Ethereum, and Litecoin, the poll of over 2,000 adults revealed. In comparison, roughly 52% of Americans own stock, according to a Gallup poll from 2016. What is perhaps more daunting to Bitcoin’s supporters who hope to boost the asset’s popularity: About 41% of those same adults say that nothing could motivate them to invest in such digital assets. Gem commissioned the survey in part to understand what could sway investors to purchase digital assets. And indeed, 50% of respondent did say they are willing to try out the asset class in the future. If your neighbor or any stranger on the street came to you late last year asking which cryptocurrencies you had bought it would have been the peak of a bubble. It was really not that extreme though, and adoption data make this point! Compared to two years ago, as explained in our 10 Investment Tips For Cryptocurrencies Investing, it was only 2% of Americans using Bitcoin. Although it is not a perfect comparison it shows how far off we are from an adoption perspective, and how slow growth has gone. Number 3 of our 5 reasons why the crypto market is alive in 2018: innovation is crazy! The level of innovation is amazing. Below is an overview of all blockchain and crypto initiatives categorized in applications, middleware and infrastructure. Not all of these initiatives will survive the test of time, on the contrary. 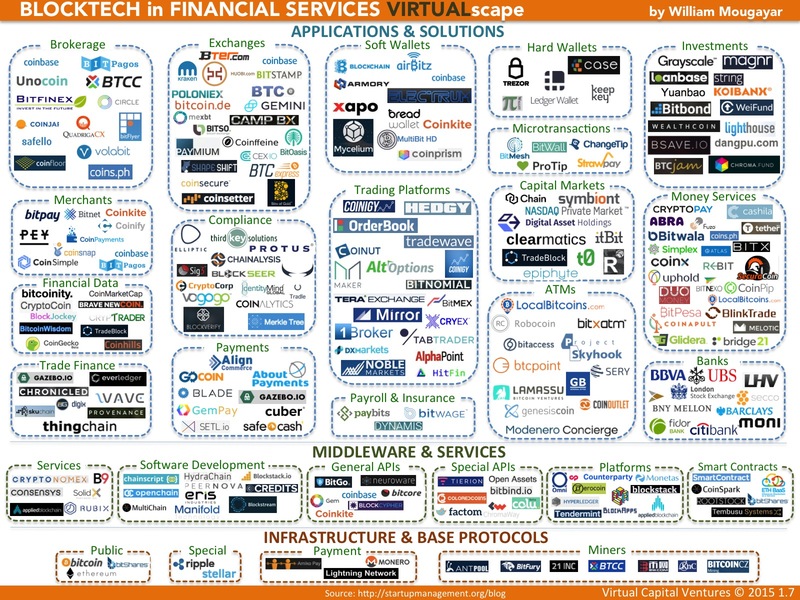 We have not included this overview to make the point that all these services will grow, and that you must ‘own’ a part of them. However, what stands out to us is this similarity with social media. Ten years ago we saw similar overviews passing by with social media initiatives. Once the hype settled it was a number of companies delivering real value. Think of Facebook, Twitter (regardless whether they struggle to be profitable), Sina and Alibaba in China, Yelp, and so on. Our point is that we have seen a very similar pattern in the past technology waves: first an explosion of initiatives, a catharsis and a divergence only to see a number of really good startups grow over time, and then explosive prices of the winners. We strongly believe blockchain and the crypto market will evolve in a similar way. This also applies to cryptocurrencies by the way. The 4th of the 5 reasons why the crypto market is alive in 2018: catharsis. A catharsis from time to time is a good thing. It’s not because many altcoins are losing serious value that the crypto market is dead, on the contrary! Given all points outlined in this article it is a good thing to have a cleaning phase. Last but not least: Bitcoin’s price chart. It is beyond us how much ‘crap’ is produced on the internet on Bitcoin’s price. There is ‘technical analysis’ on Bitcoin’s price, which ranges from charts that show Bitcoin in the last 24 hours to recent months. There is news about opinions from bulls, bears, and whatever exists in-between them. There is market cap data, and so on. Hardly anything is relevant for crypto investors. Tsaklanos his 1/99 Investing Principles applies here as well: just 1% of all Bitcoin news and charts is meaningful, all the rest is as meaningless as can be! What matters is this: Bitcoin’s long term chart is bullish. As long as the long term bull market is intact, there is no reason to be worried. Bitcoin’s long term chart shows a clear pattern. The bull market channel has several bands. Bitcoin went from the ultra bullish channel to a lower channel. Note that Bitcoin even did not make it to the lowest support channel. In other words, there is still downside potential in this mega bull market!